I was searching for an up-to-date, research-based book on ADHD and came across this book by Russell A. Barkley, PhD: Taking Charge of ADHD- The Complete Authoritative Guide for Parents. I’ve read a lot of books, but this one was a nice change of pace from the overly simplified “parenting guides” that I normally come across. That being said, it as very in-depth, probably too much so for many readers/parents; however, I enjoyed it and found it educational. The author: Russell A. Barkley, PhD. He clearly knows what he talking about when it comes to attention disorders, including current research, diagnosis, and treatment. He seems to have both a strong clinical and research background to support his suggestions in this book. The philosophy: He states in the preface that he wants to “empower” parents by teaching them how and when to make decisions through scientific thinking by being inquisitive and skeptical. ADHD is a biological disorder with a genetic basis (not caused by poor parenting). ADHD is primarily a disorder of self-regulation, not of attention. Be an executive parent: Only the parent is in the position to make the child the top priority- the parent is the decision maker and executive. Be a scientific parent. Question everything, while remaining open to new information. I enjoyed this section of the book, but I imagine a lot of parents skip the first part of this book. It is all background information on what is ADHD, what causes it, what to expect, and how it affects the family. I found his conclusion that ADHD is really a disorder of executive function skills to be very helpful and enlightening. This part of the book is filled with scientific information based on decades of research studies, and it is well synthesized for a parent to read. I would encourage every parent of a child with ADHD to read it through to help truly understand your child’s brain and development. However, it is over 100 pages long, and most parents need something more practical much sooner. Luckily, a parent can easily read ahead in parts 2, 3, and 4 and return to part 1 to learn more when ready. This 14 principles highlight key points of concern that are common among families with children with ADHD and give practical ideas of how to approach by being a principled-centered parent. It is worth checking this book out from the library, if only to reach this chapter. However, each of these key points could easily be a full week or two homework assignment for a parent to dive into and make positive changes at home through with parenting strategies. This section begins with chapter 11- 8 Steps to Better Behavior. It is a program for children ages 2-10 with normal development and no serious oppositional or deviant behaviors that the author claims will strengthen the parent-child relationship, reduce daily conflicts and arguments, improve a child’s range of appropriate and socially acceptable behaviors, and prepare a child to be socialized. Learn to manage your child in public places. Each step has about 2-6 pages explaining it with examples given. He stresses doing them in order and not jumping to later steps without first mastering the basic steps. I found his token system to be very complex, but the key concept is sound, but more explanation and possible variations could have been given on this step. I also didn’t quite feel comfortable with the emphasis on time-outs in steps 6-8 and would have liked to see a more skill building approach and positive reinforcement, rather then time-outs. These 8 steps take about 25 pages total, but I would have liked to have seen a bit more space given to each steps so parents had more practical information and steps to take at home. Part 3 continues with outlining in about 5 pages how to problem-solve issues at home (which just left me thinking that if 5 pages really held the answer to problem-solving behaviors at home, who needs a 350+ page book? ), followed with a brief discussion of peer problems and transitioning into adolescence. There is more time devoted at the end of this part to school, about 40 pages, outlining ideas from kindergarten through high school, which is overall quite helpful. Overall, part 3 felt too short with not enough practical information given for parents, particularly in the home environment and for younger children not yet in school settings. I was also left with burning questions about how to teach the underlying skills that the author claims are the core deficit in ADHD: executive function skills. This book seems to tell you all the ways to work around your child’s weakness, but doesn’t encourage parents to really understand the development of executive function skills and promote the development of executive functioning skills. As a pediatric occupational therapist, I work on this kind of skill development every day and teach parents to work on this at home as well. I found this topic disappointing lacking in this book. If you are interested in ideas about building executive function skills, see my post on this topic. A short and concise overall of medication types for ADHD with current scientific evidence for each. Well written, a good place for a parent to start researching the complicated topic of medications and ADHD. I appreciate that this section comes after all the background on ADHD, parenting principles, and management strategies, indicating that a parent must really understand first and work on parent strategies in addition to any other treatment strategies a parent is choosing to try. 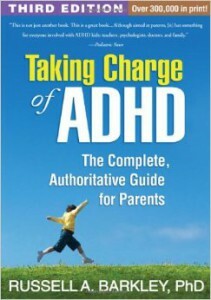 A great, evidence-based resource on ADHD for parents and professionals. The 14 Guiding Principles for Raising a Child with ADHD and 8 Steps to Better Behavior make great weekly programs for parents/family to work through to learn new parenting skills to better raise a child with ADHD. This book lacks skill building ideas to teach executive functioning skills. Dr. Barkley notes that the primary area of deficits in ADHD are related to executive functioning skills with a underlying genetic cause. He gives lots of ideas of how to adapt parent strategies and tasks to a child’s weaknesses related to attention and executive functioning skills. What about teaching and strengthening the weak skills? Current research shows that children’s brain are extremely plastic (capable of change and learning) and that the profrontal cortex (the area related to executive functioning skills) is highly plastic. The deficits in executive functioning skills are shared by many other disabilities and current research is looking at ways to strengthening these skills to improve outcomes for children on the autism spectrum, international adoption (see my posts on this topic), learning disabilities, and mental health disorders (and more). As a pediatric occupational therapist, I have a strong interest in executive functioning skills because of the impact on daily life. I have done research on the development and assessment of executive functioning skills and use practical interventions in my daily practice. For examples of intervention ideas, check this blog post about teaching executive functioning skill to children who are international adopted and this post about a program called Zones of Regulation. I am available to give presentations to small groups on parent strategies to enhance executive functioning skills, as well for for in-home training for families with children who struggle with ADHD or executive functioning skills.